2016 came with radical change to enterprise content management with a list of mergers, acquisitions, company splits, and Gartner "retiring" the term "ECM". Amidst all the change, many of us are left asking..."What does it all mean?" 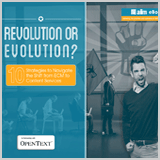 This eBook explores the key changes to this industry and takes a look at the new era of content services and what that means for you.